A contest among local tobacco control programs and community tobacco control advocates in California was held during May of 2016. The contest provided an opportunity for local projects to share their efforts in promoting the California Smokers' Helpline. Twenty-two entries were submitted by projects throughout California to showcase the creative and thoughtful ways that tobacco control advocates are promoting the Helpline in local communities. While all entries were excellent, and the competition was tough, the California Tobacco Control Program is pleased to announce the winners of the contest in the following four categories. Congratulations to all the 2016 Awards for Excellence in California Helpline Promotion winners and thank you to all tobacco control advocates who submitted their work. The California Tobacco Control Program encourages local and statewide projects to continue their efforts to promote the California Smokers’ Helpline and reduce tobacco use in your community. Contact information is listed for each winning entry if you would like more information. Please contact Kristin Harms at the California Smokers' Helpline at (858) 300-1011 or kharms@ucsd.edu if you would like to plan and implement a Helpline promotional campaign in your community. Since June of 2015, A-frame signage has been used to promote tobacco-free environments and workspaces throughout Sutter County and the surrounding community. 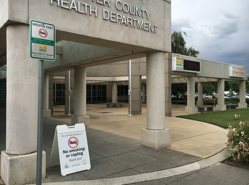 In January of 2016, the county tobacco control program purchased additional signs to meet increasing demand from local agencies to display messaging at their location. Furthermore, several agencies including the City of Yuba City ordered personalized A-frame signage for their sites and events using the Sutter County template and adding their own logo. A total of 16 signs have been distributed throughout the community at various locations and community events to promote tobacco-free community messaging. 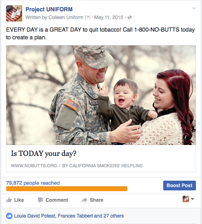 This Facebook ad was part of a larger web-based campaign aimed at encouraging US Military service members and veterans to quit tobacco. This ad was one of six, and it was the best performing message of the set. The message was displayed via a Facebook ad to service members in California. In total, over a period of one and a half months, the ad was viewed by 97,542 individuals, and it generated 3,233 clicks to the California Smokers’ Helpline website. The Native Tobacco Project created a presentation and associated handouts and materials for tobacco cessation education with American Indian community agencies and community agencies serving the American Indian population. This presentation kit is tailored to promote Ask, Advise, Refer and encourage promotion of the California Smokers’ Helpline. Extensive collaboration between the Native Tobacco Project, Del Norte County and Humboldt County tobacco programs resulted in this special community presentation project. For more information on this presentation kit, contact Nick Corcovelos at United Indian Health Service at Nicholas.Corcovelos@CRIHB.org or (707) 464-8218. A press release was issued by the University of California (UC) Davis to describe the UC Quits project that highlighted the Helpline eReferral. 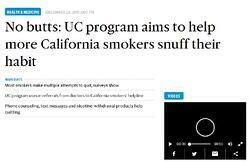 The goal was to educate the general public about how the 5 UC medical centers were connecting to the California Smokers’ Helpline through electronic health records system. The press release resulted in approximately 500 online hits per GoogleAlert, and was picked up by several publications including the Sacramento Bee. For more information on this press release, contact Cindy Vela at Cynthia.Vela@dhcs.ca.gov or (916) 703-5654. Show us your best work! What have you or your organization created to encourage people to call the California Smokers' Helpline for help quitting tobacco? The California Tobacco Control Program wants to see your materials and promotions in Print, Internet & New Media, Audio/Video, and Media Relations & Reports! The contest is now open to California Tobacco Control Program-funded projects, health systems, health care providers, and other tobacco control advocates who promote the Helpline in local communities. Entries are currently being accepted online, contest closes on May 31, 2016. A $250 shopping spree for tobacco-related educational materials and Helpline promotional materials from the Tobacco Education Clearinghouse of California (TECC) will be awarded to the winner in each of the four categories. If you have questions regarding the Contest, please contact Beth Olagues at beth.olagues@cdph.ca.gov or (916) 552-9829.